Organization Management evolve and change over time, for example change a position, organizational unit, or job description. You can use transaction code PPOME for maintenance organization management simpler and easier. Using this transaction code you don’t have to be familiar with object types. relationship code and provide you with GUI interface to select or change certain object. 1.Change the text of an OM. 2.Change the account assignment of the personnel are, personnel subarea, employee group. 3.Change the basic data and related relationship. 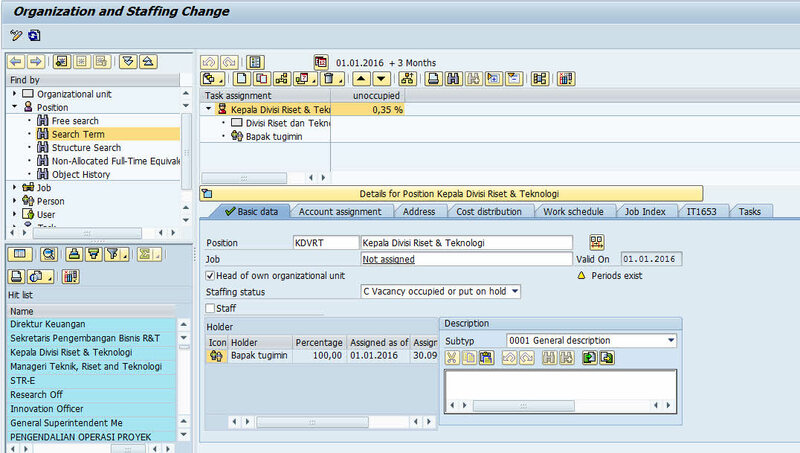 You can select any object such as Position or Organizational Unit as you can see in picture below. As you can see you can find object, select and changed the object that you want to change. For example to rename a position.